I hope you're working on getting your articles and manuscripts ready for the conference. Of course, we don't require you have anything ready for the conference, but we encourage you to. We have such amazing opportunities for you to network with professional authors, publishers, and editors. Getting your manuscript ready doesn't mean it has to be a finished manuscript. It just means you prepare. Do something. Bring it along with you so others can take a gander at it. Part of the work of a conference faculty is to give you guidance. So get those manuscripts ready and plan to sit down at a 15 minute appointment with a faculty member for some fast suggestions. CONTESTS - Man, oh Man, we have two great conference contests. The first is the Badge of Honor Contest which is for book manuscripts. Fiction or Non-Fiction and the prize is an opportunity for your manuscript to go before the board of Lighthouse Publishing of the Carolinas for possible publication. This is such an opportunity. With publishers refusing unsolicited manuscripts, entering contests like this offers you an opportunity to have your book looked at and considered by a publisher WITHOUT the representation of an agent. So take advantage. Go to our http://www.ashevillechristianwritersconference.com/bookcontest and read the guidelines, then ENTER. There is a link there for you to pay. You never know where your work stands until you step out of your comfort zone and start to enter contests. But what if you don't win? SO? That would be my response. SO WHAT! Winning a contest is not the be all, do all. What comes from ENTERING is the experience of stepping out. I see hundreds of authors a year, who never once! NEVER ONCE! Send me their work. It comes around to the fear factor. The thought of entering a contest is like your first time jumping off the high diving board into the swimming pool. We tend to stand there and stare down at the water, swallowing hard, then backing off and down the ladder. You have to bring up the courage from deep inside, look straight ahead, and walk off the board. Make a splash. And when your head bobs up to the surface, you feel success simply because you make the jump. Winning a contest is just gravy. It's the jump that counts. So gear up to enter and then DO IT. Our second contest is our devotion contest. This brings a nice plaque and publication on Christian Devotions. There are tons of ways to write devotions, but if you need guidance - go to www.christiandevotions.us then click on the tab that says WRITE FOR US. You can download our guidelines and even see an example of how to write a devotion the Christian Devotions way. You ask - why do you not give us the link to the download? Well, for a reason. Part of entering contests is learning to follow the instructions and guidelines. This is a learning process we want you to walk away from our conference having mastered. You will need this skill EVERY TIME you submit your work anywhere. Enter those contests. Step out to the end of the diving board and jump. YOU WILL BE GLAD YOU DID. WE ARE SOLD OUT! Our conference is sold out completely, on and off campus. God has once again answered our prayers to bring those He would have at this premier conference. Your first prayer for us should be this: Thank you Lord for hearing our prayers and for sending those you would have at this conference. We praise you for your favor. May we be the writers You have called us to be. I sent out invoices today via Pay Pal. It kinda floored me at the folks who sent me notices (some nice, some naughty), that they didn't owe any money. After I climbed back into my chair, I realized you were seeing Christian Devotions on the invoice. That's when I started to laugh. So folks, this conference is a product of Christian Devotions Ministries. It's part of our ministry work. When you see the invoice with the CD logo, don't panic. No one is trying to take you on a scam ride. It's just me trying to collect the owed funds for registrations. I have subtracted away your deposits, so the only thing you are getting is the final amounts due. I encourage you to pay this quickly. We need all registrations paid by Dec. 31. If you have a larger amount, please email me and we will try to work something out. But all funds must be paid by December 31. We have to pay the Cove Jan. 3. If you have questions please feel free to contact me a [email protected]. Our conferees are wonderful to pay. We have never left a conference in debt. As a small ministry we step out on faith that provision will come and the bills will be paid. Help us by paying your final registrations promptly. PROFESSIONAL PHOTOGRAPHS - We will have Mary Denman, writer and professional photographer, who will be at the conference this year. Mary will be available to take head shots for you to use in your publicity and on your website or business cards. She will offer a couple of packages and a good price for you. This information will also come to you as we firm up our final plans. But if you are in need of a professional head shot, now is the time. Mary will be sending us pricing so you can plan ahead. You will be able to make appointments with her once you arrive at the conference should you choose to take advantage of her services. You're going to hear this a lot for the next few weeks. BUY THE MP3's. Again, I can't stress the importance of this - to have this teaching year round to refer to...it's a wonderful tool and a wise business decision. Each year our wonderful radio host, Scott McCausey, records our conference. We've been fortunate to have Scott do this for us. Our conference MP3's will be $25 this year. Every class and keynote is recorded. EVERYTHING EXCEPT WORSHIP. We cannot record the worship music due to copyright laws and we are simply to small to afford to pay the royalties. If you want to take home worship music, LaTan will have her cd's you can purchase. Don't leave the conference without the MP3s purchase. WHY? Because, you will have the entire conference FOREVER! Every conference I attend, I purchase the cd's or mp3s because it is my learning at home. ACWC provides you a very nice printed manual with all the conference handouts. This means, you can go to the classes you NEED, and still be able to take home the classes you missed. WIN, WIN. Plan now to purchase the MP3s. It's business smart. It's career smart. It's continued learning smart. If you plan now, you'll be prepared to purchase the MP3's as soon as you see Renee. Please, please do not reply to this newsletter with your questions or even answers to questions I have asked. I cannot find all the responses. If you need to respond please email me at [email protected]. Remember, everything you need to know will be posted on the website, even these newsletters. We have a tab called CONFERENCE UPDATES. When you click updates you'll find information on registration, checking in at the hotels, contests as they progress. Any kind of update. Currently this page houses last year's information, but honestly, it won't change much. So read through it. Under Conference Updates you will also find NEWSLETTERS. You will be able to read every newsletter, so I encourage you to check in on this page and make sure you are getting all the upcoming news, needs, and happenings. As always, beginning in January we will offer a few weeks of emails with additional teaching for you. The closer we get to the conference, you will receive weekly letters. October through December, you will see monthly letters. YEP - I'M STILL HARPING ON THIS ONE. I can't force you to do this, but it sure is helpful for you, the conferee. WHY? Because you learn to write a bio. AND provides you a roster for future networking. If you've never attended a conference, it allows you the opportunity to see who else is attending. It breaks the ice. Not only that, but it provides our conference care representatives, Dee Dee Parker, Beth Fortune, and Cathy Baker, the opportunity to know you by name and FACE. It's vital for our little family to be strengthened as a family. And that's what we want you to think of this conference - your family. We're here for lasting relationships with you, not just a weekend. So be a part of the family. I missed these words. Over and over, I've missed them. How many times do you read a scripture, but you miss a few very important words? When they finally sink in - what a revelation. When the angel told Mary she would have a child, her response was, "How can this be. I'm a virgin." The angel then reassured her that this was from God and that no word from God will ever fail. Think about that. Think of the magnitude of that statement. NO word from God will fail. Not, "has not or will not", but WILL EVER. These are things you can (as we say in the mountains)...bet your bottom dollar on. You are given a gift to write. It may not be developed yet, but it's one of your gifts. You've also been given a desire embedded deep in your heart. That's why you are joining us. You see, God knew you BEFORE you were in your mother's secret place. He spoke you into existence, then breathed life into you. If we believe what the angel told Mary, "no word from God will ever fail." You won't fail as a writer unless you sit on your duff and refuse to do anything. God's words never fail. This is what you must grasp hold of. You may never have a published book. That is simply a trophy. But the words you have written will change lives. Be it in a book or for the person sitting next to you. Always work toward publication but don't let that be the only reason you write. 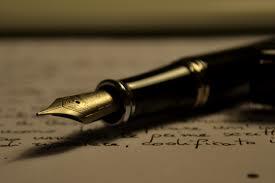 Write because God has given you a gift, and words to change lives. Publication is a sweet moment of reward. Remember, when you put forth the effort, God will not let you fail. Mary didn't necessarily understand, but she "got" that she was chosen. And her heart turned to straight to trusting God. She did not fail. Neither will you when you put forth the effort - God has blessed your gift. Use it. Develop it. Give it. Copyright © 2017 Christian Devotions Ministries, All rights reserved. Stepping UP and Stepping OUT Writing for the Kingdom, One Word at a Time.